Our product range includes a wide range of as 25-ir sm ( mirror finish ), jet hand dryer, as 25-ir w hand dryer, as 25-ir sb hand dryers and ash-70sb hand dryer. 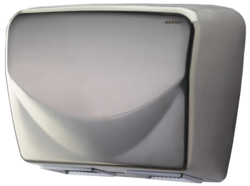 Relying upon highly developed infrastructure unit, we are affianced in manufacturing, exporting and supplying a wide assortment of Stainless Steel Hand Dryer (Mirror Finish). This is highly appreciated due to its excellent bright surfaces and is used for drying hands in public washrooms. It is manufactured by our ingenious professionals using quality assured steel at our well maintained unit. 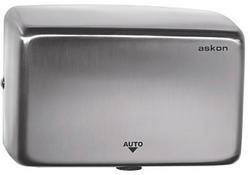 Additionally, the provided Stainless Steel Hand Dryer (Mirror Finish) can be purchased from us at nominal prices. If somebody is misusing the hand dryer (like drying hair, clothes, hanky etc), the hand dryer will enter a shut down period of 30 seconds after 75 seconds of continuous use. During the shut down period, the hand dryer will not start for 30 seconds even if object is present in front of the sensor. After 30 seconds, the sensor will check if the object is removed. If the object is removed, the hand dryer will function normally. Otherwise it will continue in the shut down mode until the object is removed. This feature also helps in preventing vandalism. It is aimed at significantly reducing the machine downtime, damage and repair costs due to misuse. 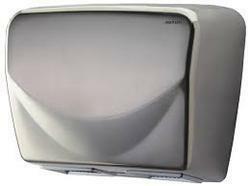 We have carved a distinct position in this domain as a leading manufacturer, exporter and supplier of Stainless Steel Hand Dryer. Offered hand dryer is manufactured by our experienced professionals using top quality steel and contemporary techniques as per set industry norms. It is used in public as well as private washrooms for making hands dry and also highly appreciated due to its durability. 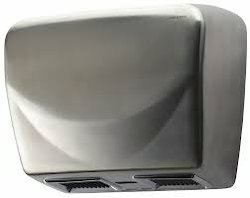 Besides, this Stainless Steel Hand Dryer or SS Hand Dryer is made available with us at competitive rates. With the guidance, efforts, experience and knowledge of our skilled professionals, we are supplying an exclusive range of SS Hand and Face Dryer. The offered range is widely used in various places malls, restaurants, hotels, etc. All the products are designed by using the latest techniques and top quality material. To provide the defect free and genuine products to our patrons, the offered range is examined on different aspects. 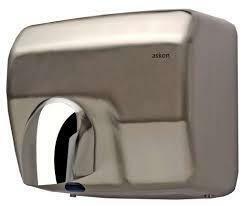 Furthermore, all the precious clients can avail the offer of SS Hand and Face Dryer at market leading prices.